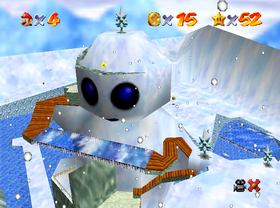 Snowman's Land is the tenth course of Super Mario 64 and Super Mario 64 DS. It is the second snow-themed course after Cool, Cool Mountain. The entrance to the course is in the mirror room on the second floor of Princess Peach's Castle to the left. While there's no actual painting for the player to jump into, the painting is reflected in the mirror, which shows the same painting as the one used for Cool, Cool Mountain. The entire course takes place around and on a large snowman-shaped mountain. 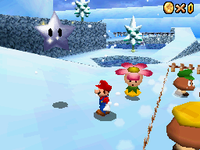 The player starts off in a snow field next to the course's cannon and Star Marker, though the Star Marker is absent in the DS version due to it being moved to inside the igloo. To the left are a trio of Spindrifts and a Money Bags, along with either an ice sculpture or stacks of ice blocks in the N64 or DS version respectively. To the right of the starting area are several slopes overlooking a ravine with an Amp circling around inside it. Should the player step into this ravine, a large gust of wind will begin pushing the player toward the course's edge. Past the ravine is a slope that leads to the area over the freezing pond with the Chill Bully, along with a fenced off area with cap wearing Goombas in the DS version. The pond underneath the Chill Bully acts similar to lava; stepping into it will send the player into the air, taking damage. Past the Chill Bully is a snowfield with a couple of Spindrifts, a Money Bags, and a Mr. Blizzard. To the left is a different freezing pond, one that will slowly sap the Health of the player if they remain in it. 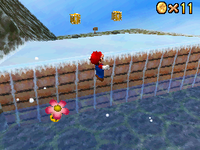 Using a Spindrift in the water (or Luigi's backflip), the player can reach a ledge containing the Power Star of the third mission, a Shiny Shell, and a path to another ledge, which contains Red Coins in the original version of the game. Down the path in the freezing pond, several slopes will come out of the mountain and attempt to push the player into the pond. Past these is a tall ledge and a path up the mountain. Near the top of the mountain is an ice bridge with a Penguin walking across it. Stepping onto the ice will cause the Snowman head to blow wind out, which will blow the player back to the start if they get caught in it and make them lose their cap. To avoid it, the player needs to climb onto the Penguin's head and ride it to the other end in order to reach the top. An igloo can be accessed from the second freezing pond by riding the Shiny Shell up the slope to the left path in the pond. In order to enter the igloo, the player has to crawl into the opening. The appearance of the igloo's interior changes based on the version of the game. In the original game, several walls of ice make up a maze with several Coins inside it. 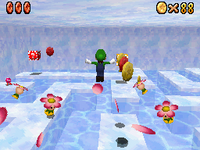 In the DS version, there is a large freezing pond instead, with several Spindrifts, Coins, and Red Coins. In both games, a Bob-omb Buddy can be found here and speaking to him will open the cannon at the start of the course. Super Mario 64 DS This mission's objective is to collect the Power Star on the top of the mountain. Super Mario 64 DS The mission's objective is to defeat the Chill Bully. Super Mario 64 This mission's goal is to navigate the large ice structure. 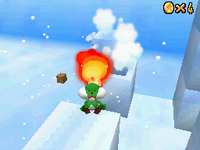 Super Mario 64 DS This mission's objective is to melt the blocks of ice using Yoshi's Firebreath. Super Mario 64 DS This mission's objective is to collect the Power Star near the freezing pond. Super Mario 64 This mission's objective is to use the Shiny Shell to collect the Red Coins. Super Mario 64 DS This mission's objective is to use the Shiny Shell to collect the Silver Stars. Super Mario 64 DS This mission's objective is to collect the Power Star in the igloo. Super Mario 64 DS This mission's objective is to collect the eight Red Coins in the igloo. Homing Mushroom : #1 At the tree on the top of the Snowman. Static Mushroom : #2 In the igloo, reached by Vanish Cap. Box Mushroom : #3 Behind the Chill Bully's platform, along with some Spindrifts. #4 In the igloo, near the Bob-omb Buddy. The correct angle to get the coin. There is a misplaced coin found inside the wooden platform on the snowman. It's possible to get the coin if Mario shoots himself at the exact angle as shown on the right. The name of this world may be a pun on "no man's land". 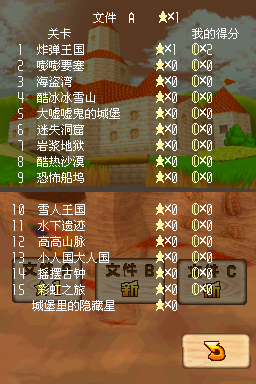 ↑ From the score sheetMedia:SM64DS course list in Chinese.png and the Power Star menu of Super Mario 64 DS as localized by iQue. This page was last edited on February 14, 2019, at 20:55.